Sculptures at Glenkiln Reservoir – Another Hidden Gem in Dumfries and Galloway. Being a born and bred local lad I have been amazed and pleasantly surprised to find some wonderful places to visit in the region that I was completely unaware of until I started running Glenaldor House last November. Following a visit to the B and B back in April I wrote the blog on “The Garden of Cosmic Speculation” just outside Dumfries. It took visitors from Germany who had came here specifically to visit the garden to make me aware of this fantastic and original attraction on our doorstep. 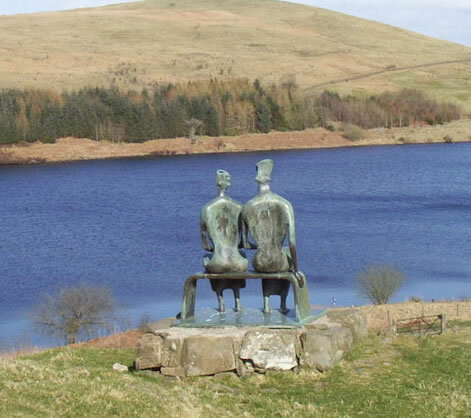 Last week I was caught out again when a guest informed me that he was here to visit the Sculptures at Glenkiln Reservoir approx 6 miles from Dumfries. To my shame I had never heard of the place, therefore I was even more amazed when I found out that some of the sculptures on show are by names no less that Henry Moore, Jacob Epstein and Auguste Rodin!!!. Once again I had to research and find out more. I discovered that the statues were assembled on the land next to Glenkiln Reservoir by Sir William Keswick between 1951 and 1976. Sir William Keswick was a close friend of Henry Moore and worked closely with him and other artists, experimenting with the concept of putting their work in an open and natural setting. The collection of sculptures are located in a beautiful and remote piece of the countryside and the very fact that there are hardly any signposts, that the terrain is rough and that the only way in is on a small single track road probably helps to explain why the location is a bit of a hidden secret, however these same obstacles also lends to the fantastic sense of discovery you feel when you drive along the road thinking you are going the wrong way only to find a Henry Moore “The Standing Figure” on the horizon. Follow that with the discovery of August Rodin’s bronze figure of “John the Baptist” then Jacob Epstein’s “Visitation” and then Moore’s 11 feet high “Glenkiln Cross” plus many more exciting sculptures and it certainly makes the trip well worthwhile. The full walk is about 5 miles long and will take a good 2 hours (if you are lucky enough to find everything 1st time round – as mentioned signposts are not in abundance). Dumfries and Galloway and in fact Scotland are very fortunate to have such a wonderful place to visit which is only heightened by the fact that it is relatively unknown. If it is a good brisk and normally windy walk you are looking for with the addition of some famous artists works get your sturdy boots on, trust your sense of direction and you will have a good, free day out.